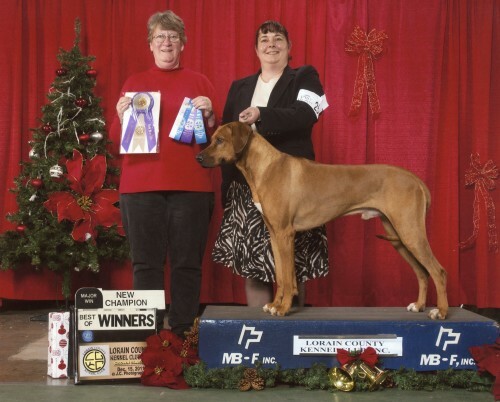 Achievements: River has proven the versatility of the Ridgeback, competing and excelling in a number of venues. He is a breed ring champion in AKC, UKC and International shows; he has titles in obedience, rally and agility. In AKC, he has earned the Rally Excellent (RE) title and the Beginner Novice (BN) title in Obedience. In CPE (Canine Performance Events) agility, he is in Level 5 Standard and Level 4 in Jumpers and Games, working his way to an agility Championship title. We have tried the new sport of Barn Hunt.